If your house is like mine, your pre- and post-Easter refrigerator is overflowing with colorful, spotted, striped, and sticker-covered hard-boiled eggs. 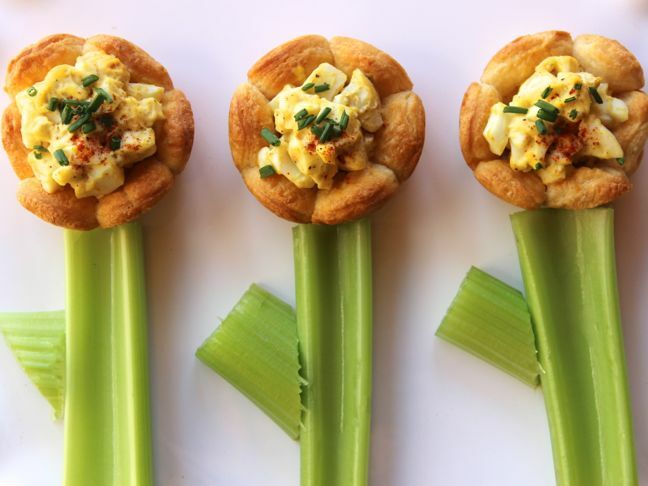 If your kids are like mine, they will be more inclined to eat healthy food if it looks yummy and is presented in a clever manner. 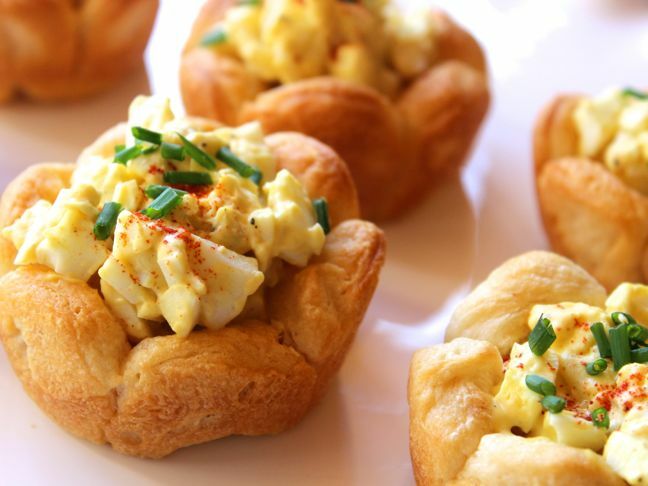 Step 1: Make egg salad and chill in the fridge. Step 2: Roll out the crescent roll dough. Press together all the seams. 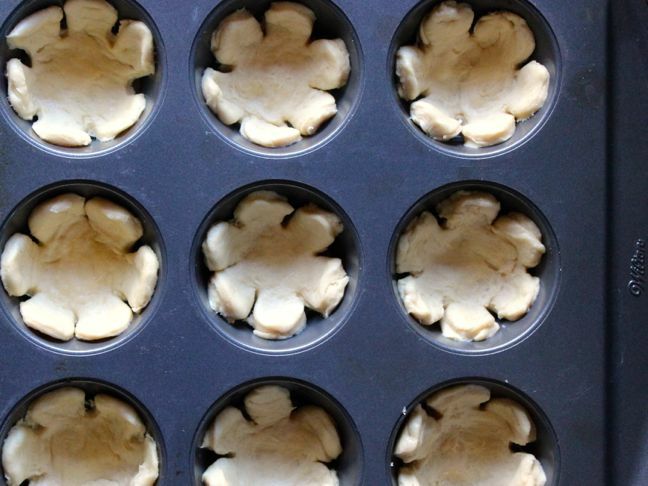 Step 3: Press the flower shaped cookie cutter into the dough. 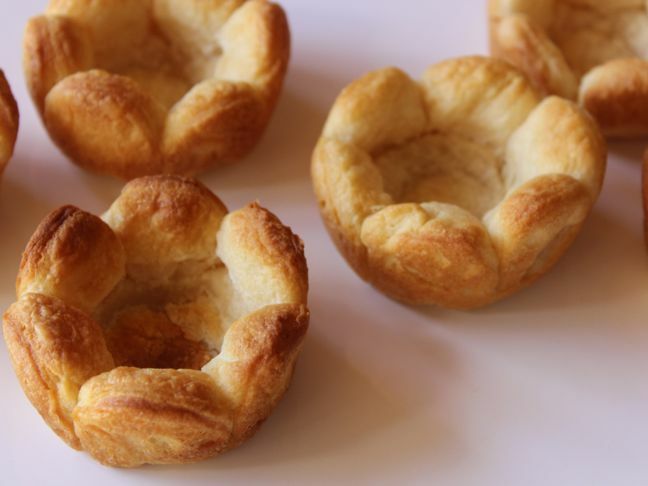 You should be able to make 12 "cups" with one can of crescent rolls. 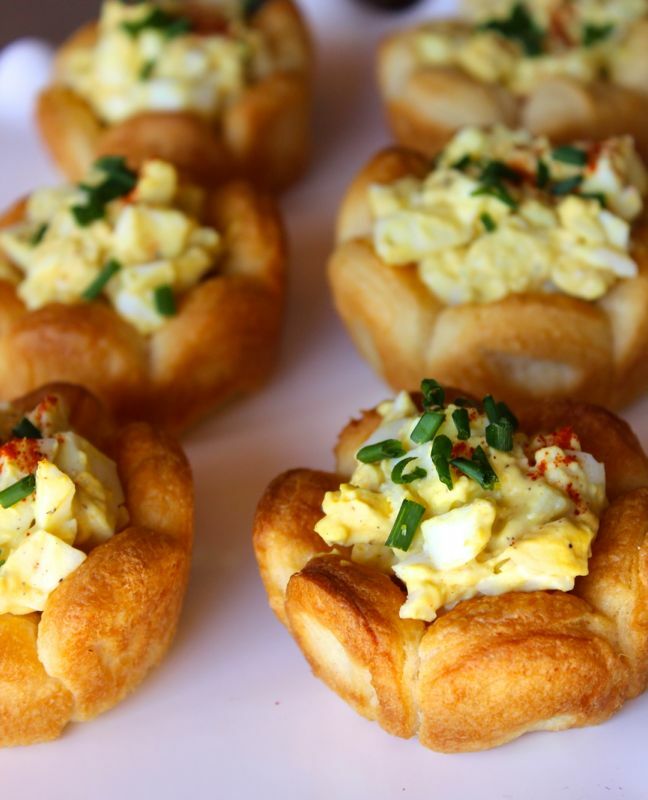 If you have a small cookie cutter, you can use a mini muffin pan and double it. 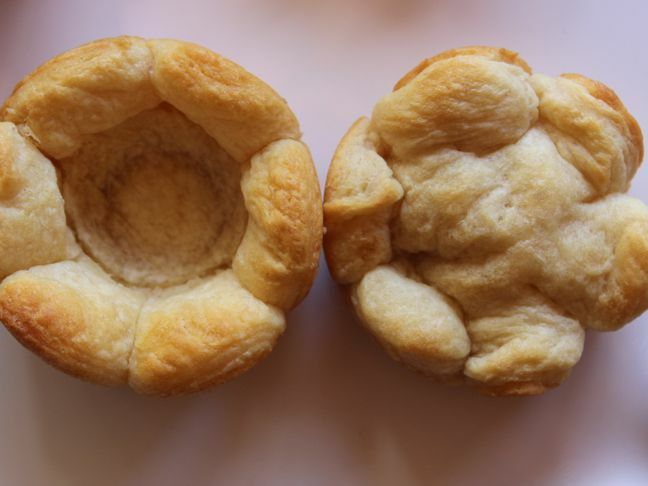 Step 4: Gently press the center of the flower into the muffin tins. Make sure the center of the flower is on the base of the tin and the petals are spread out evenly along the sides. Step 5: Bake according to directions on the cresent rolls package. Keep an eye on the rolls. They should be golden brown when they are done. Step 6: Upon removal from the oven, use a small spoon or teaspoon to press the inside of the flower down. It will rise when it bakes, so you can either press it down when it’s about ¾ cooked in the oven, or press it down when you remove them from the oven. Step 7: Let the flower cups cool. 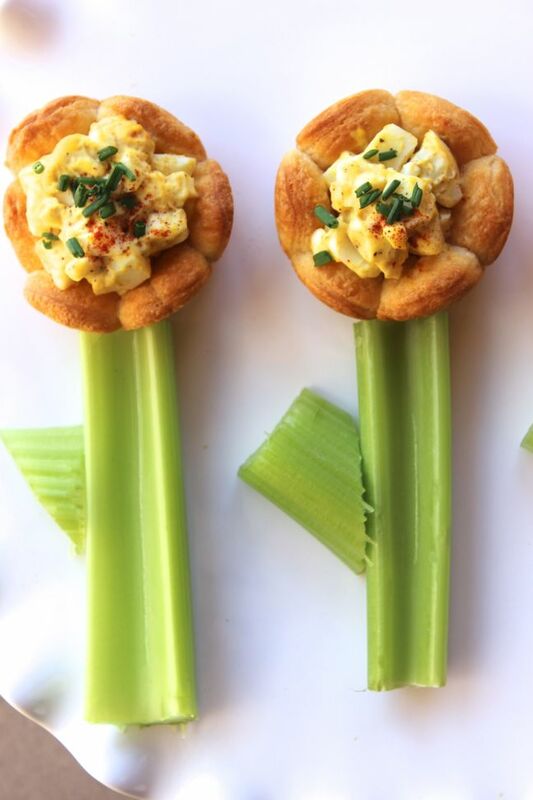 Step 8: When you're ready to serve, add a large spoonful or two of egg salad to each flower cup. Step 9: Top with a sprinkling of paprika and chopped chives. 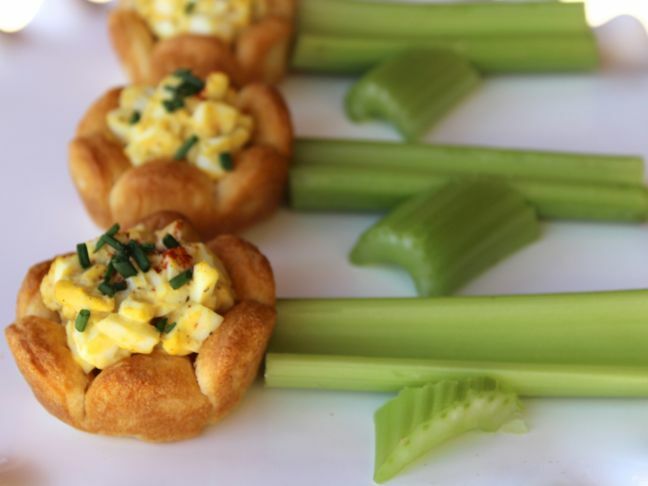 Step 10: Serve on a plate with celery sticks for stems.